GENERAL CHARACTERISTICS: The lagoon jellyfish has many subspecies that grow more dissimilar as they age. The translucent bell of Mastigias papua is usually hemispherical, with a diameter up to 80 mm (3.15 in). This species has 8 frilled oral arms, rather than tentacles, whose total length is approximately equal to the bell-radius. Color variation exists within Mastigias papua, though the bell is usually greenish blue to olive green with yellow, white, and/or brown oval, granular spots across the rim (over the exumbrella). This coloring can be attributed to the zooxanthellae that reside symbiotically within the lagoon jellyfish (mostly in the mesoglea). DISTRIBUTION: Found in the Indian, Western Pacific and Western Atlantic Oceans as well as Lake Palau where it tends to dwell within the top 2.5 m of the water during the day to allow its symbiotic zooxanthellae access to light. DIET IN THE WILD: Small zooplankton (30%) and photosynthesis from algae inside their tissues (70%). During the day, the spotted jelly will travel upward, orienting its body to absorb maximum sunlight. REPRODUCTION: Asexual reproduction by budding can occur year round, Eggs hatch into planula larvae that swim around until they find a suitable substrate to settle developing into a sessile polyp which create motile buds asexually, or forming ephyrae which mature into free swimming medusae. Longevity: More than three months in captivity. PREDATION The only creature that has been confirmed to prey on Mastigias papua is a sea anemone, Entacmaea medusivora. 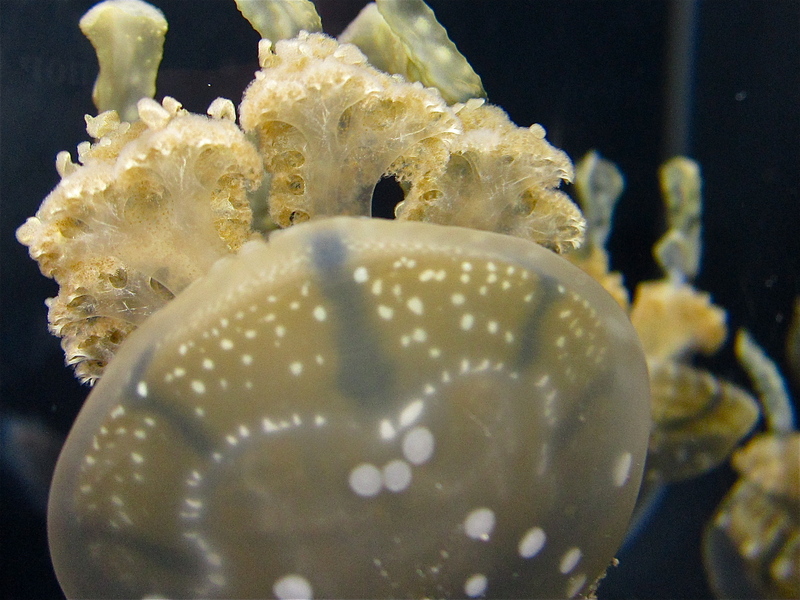 REMARKS: Some of the larger spotted jellies actually have small fishes living with them. 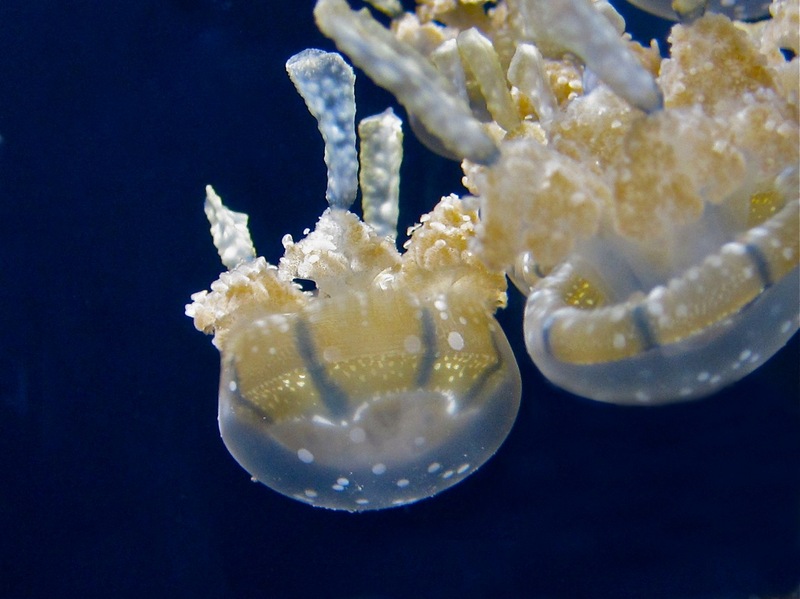 The fishes use the inside of a jelly’s bell as protection from larger predators until they reach maturity. Human contacts may experience many adverse effects such as rashes, severe itching, nausea, and vomiting when contacting tentacles.